The garden, designed and built by Kate Durr, is in support of Ucare, an Oxfordshire based cancer charity for urology research and awareness of urological cancers. Only 7 weeks into her year long professional garden design diploma course, with The Cotswold Gardening School, Kate Durr won the opportunity of building a Festival Garden at RHS Malvern Spring Festival. Kate’s festival garden is an elegant garden full of sensual contrasts. The linear design, constrains the voluptuous planting. Dark, reflective water, created by the use of Dyofix, is dominated by a statuesque feature wall of steel panels, that capture the sinuous shape of the fern. 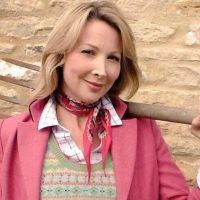 Kate, a TV presenter and married to actor Jason Durr, is a keen user of Twitter @katecharman and has been tweeting about using Dyofix in her garden design.